At Trinity Beach Dental, we work closely with each patient to plan the best type of treatment for their smile. Tony is happy to review various options available to keep your teeth healthy even if they’ve been through a lot in the past. 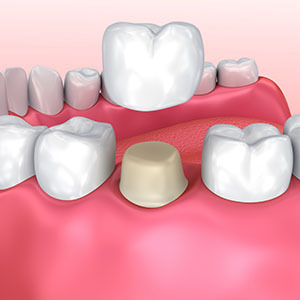 If you have a large filling that needs to be changed out, recently had a root canal or have a deep cavity that needs more than just a ‘patch,’ then a dental crown is likely the next step. Crowns cover your tooth entirely, up to the gumlines. As such, they provide protection from bacteria and biting forces that could cause the tooth to break apart even further. Crowns can be made from many different materials. The most common are Porcelain, Zirconia and Gold. Selection is determined by your individual cosmetic and strength requirements. Your crown will not be processed by a machine or in a cheap overseas laboratory. It will be custom made for you by highly skilled technicians here in Cairns. Tony usually requires two appointments to complete the crown. The first visit involves preparing your tooth and taking an impression. About two weeks later, the permanent crown is back from our lab and ready to be seated into place. Do you struggle with embarrassment caused by a missing tooth? A dental bridge serves both a functional and aesthetic purpose. It is supported by healthy teeth on either side of your missing one, with functional crowns supporting a pontic tooth between them. You can also choose to have a bridge or crown supported by dental implants. Tony is happy to discuss this process with you so that you can make an educated decision on the best treatment for your needs. In addition to being an in-network provider with Bupa and HCF, Trinity Beach Dental also accommodates our patients with convenient 0% financing plans. Contact us today to learn more or to book a complimentary smile makeover consultation.